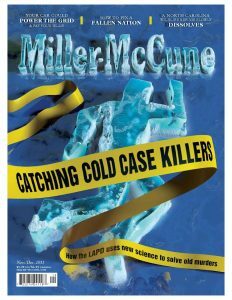 Since the Los Angeles Police Department’s Cold Case Unit began operations 10 years ago this month, detectives have arrested seven serial killers, and dozens of others, who thought they had – literally – gotten away with murder. How the long, slow confluence of science and technology, paired with the grit and determination of a handful of people, got cold killers off the street. To continue reading “Not Forgotten” online, click here. To read “Not Forgotten” as it was published in the magazine, click here for a PDF. (To download, right-click and select “Save as…”). Given the story’s length, photos, and illustrations, I recommended the print (PDF) version.